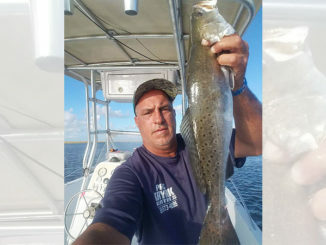 Reggie Legendre of Lafourche has been catching plenty of limits of speckled trout between Golden Meadow and Grand Isle recently. And he doesn’t even use a boat. Legendre keeps things simple by fishing from the bank with just a few pieces of tackle. “I am strictly a land fisherman. It’s a great way to get in 20 minutes of fishing, or an hour or more without having to worry about all the time it takes to launch a boat and get to a fishing spot. We are blessed with plenty of fish and lots of great fishing spots that you can walk to,” he said. Legendre doesn’t get bogged down with lots of tackle either. What he fishes with works just fine, and he only takes as much as he can carry on his own. “I fish with a 2500-series spinning reel, a 4 Horsemen popping cork, and a Matrix Shad or Matrix TKO Shrimp on a 1/16-ounce Deathgrip jighead. That’s all you need to catch a limit of trout,” he said. 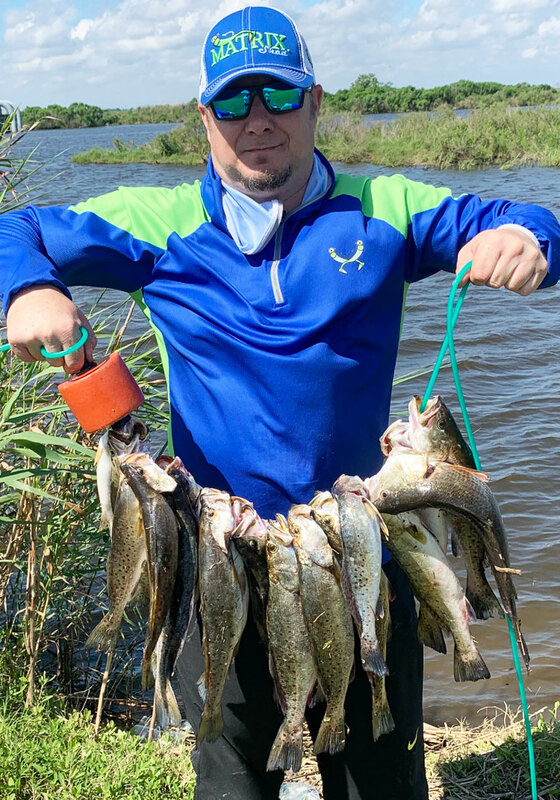 Reggie Legendre of Lafourche with a limit of trout he caught while bank fishing down LA 1. When it comes to lure colors, Legendre has a few favorites. Shrimp creole, pink champagne, and lemon head, are his go-to colors. His most recent catches have come on the rising tide in fairly clear water, but that’s just because he happened to be fishing then. But he said his technique will work on any tide, and in any conditions. 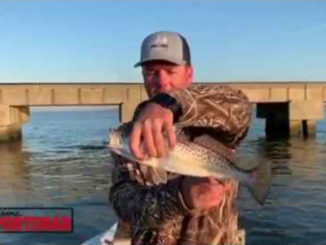 “Whether it’s windy, high tide, low tide, raining, whatever, the fish are still there. You have to find them, but once you do, you can catch them this way no matter what the tide is,” he said. 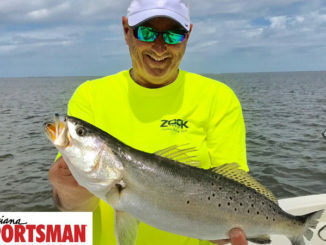 Using a 16- to 18-inch leader between the cork and jighead, Legendre said the trick is to work the bait back to you at a steady pace with a pause in between double pops of the cork. “I work it in a pop-pop, pause, pop-pop, pause method — two quick pops of the cork, followed by a pause. That pause is the key because it lets the lure sink to its maximum depth below the cork. If you just pop it all the way back without a pause, then the lure isn’t sinking in a natural way,” he said. 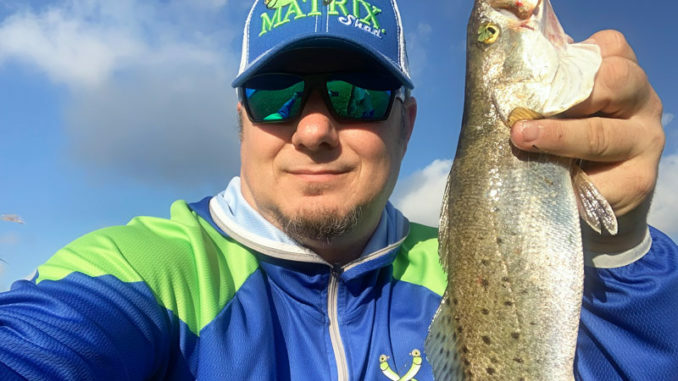 While Legendre doesn’t mind keeping some trout for the super table, he also catches, tags, and releases plenty of trout. The tags he uses are blue with Matrix Shad’s website and a tag number printed on it. If you catch a fish with one of these tags, take of a photo of the tag and post it on the Matrix Shad Facebook page to win some great prizes from the company.